In an effort to increase public safety Metrolink has announced that Amtrak will take over operations of its commuter rail system this summer. Amtrak’s experience, safety record and level of service are cited as reasons for the new partnership. The contract has Amtrak operating Metrolink trains for the next four years, with the potential for two three-year extensions. 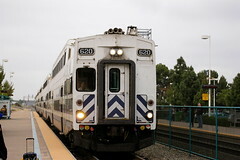 Amtrak operated Metrolink trains for 1992 to 2005 after which Veolia Transport took over. Veolia’s contract expires in June. Read the full press release on the Metrolink blog.